Setting the Pace for United Way in 2013 - Benchmark Inc. 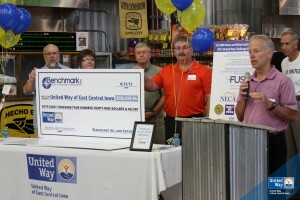 Benchmark owners present United Way of East Central Iowa with a check. CEDAR RAPIDS, IA, September 2013: The 97 employees at Benchmark never shy away from a good challenge for a great cause. So, when the United Way of East Central Iowa asked Benchmark to be a “PACESETTER” for the 2013 campaign, the answer was a resounding YES! Only two companies in east central Iowa are chosen to help set the pace for the year so this is quite an honor for Benchmark. Through annual pledges, combined with the activities above and a generous donation by Benchmark, the total Benchmark donation to United Way of East Central Iowa was $58,439.04. This was the most ever contributed by Benchmark and exceeded their goal by 22 percent.